At this time of the year, customers’ thoughts are turning to the sales. It is a competitive marketplace out there on the high street, and many of your competitors will be targeting the same customers as you are with increasingly lavish shop window displays. How can you make your retail premises stand out and make sure customers are clear about the deals you are offering? Have you considered using retail window stickers? There is no point in having a sale unless people know about it, but at certain times of the year, it is difficult to stand out from the crowd because there is so much activity. Coming up with innovative shop window display ideas is hard, especially when you want to portray a strong corporate image. 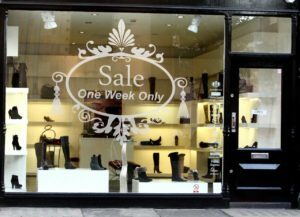 Retail windows stickers are an increasingly popular way that retail businesses are using to attract customers and spread the message about sales and discounts. You can have discount window stickers made up in colours and designs that match your corporate branding or seasonal theme and use them to convey messages about sales and discount activity to your customers in a concise, attractive and impactful way. 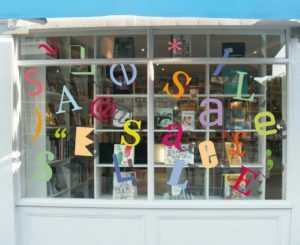 There are a multitude of ways to use window stickers to promote your sale. You may have show window display ideas that have been designed in-house, or you may prefer to use our predefined professional templates. You can buy large, individual stickers or packs of multiple stickers in smaller sizes. All of our discount window stickers stickers are available in your choice of design, size, colour and material. You can choose hard-wearing self-adhesive stickers or opt for our reusable self-cling film window decals that are suitable for removal and reuse. Purlfrost are experts in retail window stickers. Our window stickers are available in a choice of colours, sizes and materials. They can easily be applied to glass or any other flat, smooth surface including plastic, metal and even wood if you choose self-adhesive decals. All you need to attach them without bubbles is some soapy water in a spray bottle, the supplied application tool, and a little bit of patience. At the time of ordering, you can select whether you intend to apply the sticker internally to glass (so the image is reversed), or if you need it to be printed as seen for you to stick on another surface. We digitally print all our designs with UV resistant ink to ensure that the colours last longer. We even back print reversed designs that will be placed behind glass with white ink to make the colours look more vibrant. To find out more, you can contact us on 020 8992 4024.